Most art exhibitions in Asmara host acrylic on canvas medium with the emphasis of modern art that go as far as abstractions. Certainly, this does not mean that there were no artists who like to stick with realistic presentations of their subjects as well as who use other mediums – such as water and oil colours, and found objects. with some paintings – such as drawing works by Elsa Yacob – on various occasions. However, this is probably the first exhibition which is all black and white or drawings and sketches to be displayed in the city. Anyone who has seen his previous exhibitions might have expected modern art paintings. Speaking of his previous works, he stated that he had been so much in love with modern art then. “Now, though, drawing itself as one part of visual art, I wanted to try to find some identity and be recognized through it in the future,” he added. All the drawings and sketches, being black and white, depicted realistic subjects of which about 65 percent of them were portraits. Most of them are part of his studies as well as sketch preparations that were supposed to evolve into paintings. The portraits represent various sectors of Eritrean society – ethnic and age groups. He has also included a portrait of a camel which he indicated a rare happening and wants to continue with other animals too. It is always indicated that drawing is one of the basic parts of study in schools of art and architecture. It is also noted that it is the precursor of all other forms of art divisions. Seare, who started to draw since he was very young, believes that drawing provides ample chance for an artist to develop his skill in all other forms of visual art. For that matter, no matter how one knows the harmony of colours, having no kill in capturing the lines, proportions, shade and light of a subject does not make one an artist. Therefore, it is a basic skill that an artist should always endeavour to perfect. Mastering that skill, consequently, may widen the door of creativity that the artist would pass through. Without including the works created from mixed and other mediums – pencil, charcoal, pen and pencil, marker or mixed – half of Seare’s drawings were produced with pen. We all know that let alone drawing, even writing with a pen needs concentration so as not to make any mistake. In these drawings, we see steadfast concentration, patience and skilful observation on the part of the artist. There is also nothing that reflects that the works were done using scales or projector. They are, therefore, pure confirmations that the artist’s endeavours towards elevating his skills to a higher level would not be very far. Artist Seare stated that he had always drawn on any material he found including his body parts as his family members used to hide papers out of reach so as to make his concentrate on his education. His love for it has helped him to accompany it with painting. 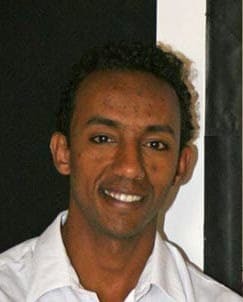 He enrolled in Asmara School of Art in 2000 and is one of the school’s first batch graduates. Speaking of where he found his subjects, he stated that his main sources were books and magazines, pictures he took with his own camera, the annual festival Eritrea in which the whole nation is almost shrank into a single village, and the Internet. He indicated that the festival is his prized source for it gives him a first-hand experience in relation with his subjects. The art works in the exhibition were not framed with glass with which they are usually expected to be. That enabled audience to have a closer look and personal feel. As they were direct representations of people’s lives, some felt that their titles did not transcend beyond what were displayed. To this, Seare replied that life has many meanings or gives each one of us different meanings; giving a title to a drawing of people who live along the banks of a river “Gash River Life” may reflect the meaning of life for the people who get their subsistence from the river. Seare’s concentration on details seems to stand out more than his concentration and interest in backgrounds. In many of his drawings we find almost void backgrounds, especially of those portraits. This method of accomplishing his work seems to have helped him to pay all his attention to the tiny bits and pieces of details of the subjects. “”Gendefa” Hidareb Man” and “Girl in a Pearl Dress”, both drawn with pen, are very good examples of the artist’s patience and concentration. In the former, anyone’s attention is certainly drawn with the precision of his lines on the subject’s mouth and teeth as well as the Hidareb ethnic group’s traditional embellishing lines cut on a person’s chicks – shedeli. The wrinkles on the neck of the girl along with the pearls and stunning design of her dress in the latter definitely suggest his love for details. “Camel Transport” is no different in its background from the other drawings. Its beauty transcends in its composition. The shadows of the camel and the man leading it reveal that the harsh lowland sun was close to overhead. Moreover, the subjects’ perspective, which is another important element in drawing, is almost perfect and so gripping. The pasture of the man leading the camel makes it easy for a beholder to figure out the age of the man. While his concentration on his subjects appears to strengthen his wonderful skills in capturing their details, Seare seems to give less attention to backgrounds. He has also left some parts of his subjects unfinished in his drawings. In “”Gendefa” Hidareb Man”, as much as he toiled for the details on the face, he made very small effort with the hair. He has not been able to capture the flowing river in “Gash River Life” which is a central element of the drawing and from which one may get the feel of the bank of the river and the people who live along it. “Taking Rest” is also void of any background. Had it had any background, probably it would have intensified the elderly man’s exhaustion and be felt by viewers. It could be reasoned that the artist’s studies and main concentration was on the subjects. However, as long as they are brought to an exhibition, it would be expected of the artist to provide the audience with completed works that could give them some feelings. Speaking of modern art, Seare indicated that it seems that is too early for the average art audience. Although an artist puts lots of creativity and hard work into it, many would just take it as copies of western artists. He also did not hide that many modern art painters do not even show their drawing skills or when one expects them to come with wonderful drawings believing in their skills, they do not reflect them on their paintings. Stating this, he also expressed his conviction that the biggest part in an artist’s work is studying and experimenting as well as to be open to different horizons of art works. In addition, he said that Eritrean artists’ main goal should be to give the taste of Eritrea contributing their part to make it known to everyone. The drawings and sketches by artist Seare have come at a time when many artists complain about high prices and unavailability of art accessories and colours. Commenting on this, Berhane Tsegeyohannes, a painter and cartoonist known as Bruno, said that Seare has proven to us that the complaints stated above are just excuses and that the exhibition was a good example that an artist should be flexible and innovative working with whatever material is available. Muller Gebre on ፊልም “ትማሊ” — ታሪኽ’ዶ ልብ-ወለድ?